rodpedersen.com: INTRODUCING "OUT OF THE TUNNEL"! INTRODUCING "OUT OF THE TUNNEL"! Hello friends, welcome to the premiere edition of “Out of the Tunnel”. 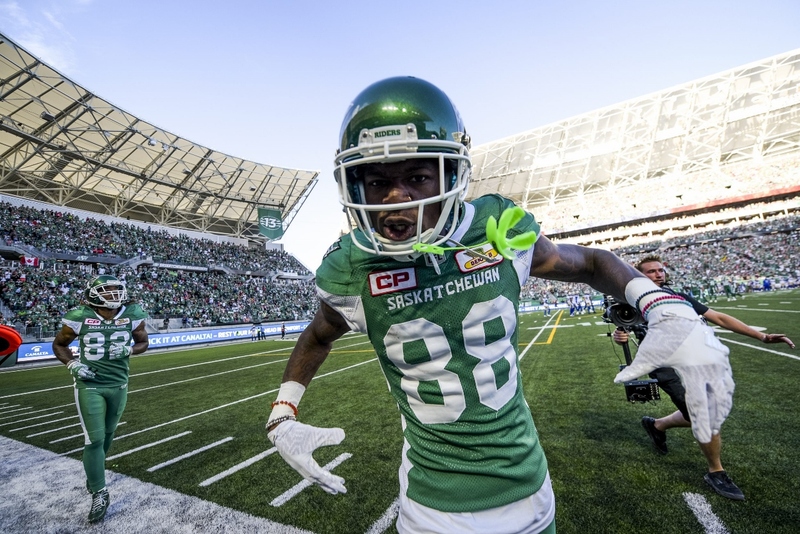 This will cover all things football with a Canadian flavour: from the CFL, USports, CJFL, Canadians in the NCAA, and Saskatchewan high school football with a few other things to help fill the week between games. What do we know after two weeks of the 2017 CFL season? The first two weeks of the CFL season are almost an extension of the preseason. The CFL doesn’t have the NFL luxuries of full rookie camps, OTA’s and mini camps. The first real install of a CFL offensive and defensive game plan is day one of training camp. We here at RodPedersen.com know that every game is important, with little time to break in a new offence, defence, quarterback, secondary, etc. A true feel for what a team will or will not be isn’t known until the fourth or fifth week of the season. Alarm bells are ringing throughout the province with the 0-2 start to the season. Can’t blame the fans, because it has an eerily similar feel as a lot of the losses from the 2016 season … close, but just not good enough. The conundrum from the first two weeks comes down to the difference of one play. A veteran team would make those plays, yet they just seem out of reach for the 2017 Riders. The difference this season is that these games are happening early. Opening Mosaic Stadium with a loss to the Winnipeg Blue Bombers stings, but maybe, just maybe, they are getting some of these woes out of their system early in the season. While the Riders have lost their games by a total of four points, the Eskimos have won their games by a paltry seven points. This is what teams with a winning, veteran presence do … find a way to win. Who knows how long it will last? The injuries to linebacker J.C. Sherritt and running back John White will reflect on what kind of work General Manager and VP of Football Operations, Brock Sunderland has done in the offseason. He has done well with the signing of defensive end Da’Quan Bowers (Clemson) and receiver Duke Williams (Auburn) as well as catching a little luck with Canadian defensive back Arjen Colquhoun (2nd/16th overall in 2016/Michigan State) coming back after a short stint in the NFL. Sunderland will need these three and a lot more for the Eskimos to continue their hot start. They looked lights-out offensively in their Week 1 smashing of the Hamilton Tiger-Cats. Ricky Ray played like he was 10 years younger, the receivers looked like the second coming of Derrell Mitchell and Pinball Clemons, and the defence stopped a traditionally strong Ti-Cat offence. Fast forward to Week 2. In a tight game, the Argos took a 15-10 lead on the B.C. Lions early in the fourth quarter (on an Armanti Edwards touchdown catch), but after that it was all Leos. B.C. scored 18 straight points while an Argo offence that had over 500 yards through the air the week before, stalled. The result was a 28-18 loss on home turf. So, as we turn back to the original question: After just two weeks of the CFL season, can we make a judgment on these or any other teams? Will the Riders continue to have victory just out of their reach? Will the Eskimos continue to find ways to win in the face of mounting injuries to key players? And are the Argos the dynamic offence in Week 1, or the pop-gun show in Week 2? This is the fun we will have as the rest of the CFL season unfolds. As the season turns from the warm sunny summer sky, to the crisp autumn breeze, more football will be covered on “Out of the Tunnel”. The CIS season kicks off out East on the last weekend in August with CanWest lifting the lid the following weekend. The CJFL begins the year on August 12th with a pair of PJFC/OFC interconference games along with a pair of PFC games. The NCAA college football season gets rolling at the end of August. Each week, along with giving you a wrap of football in Canada, “Out of the Tunnel” will spotlight a Canadian to watch in the NCAA. This week, one of the top offensive linemen available in the 2018 CFL Draft, Ryan Hunter. Hometown – North Bay, Ont. The multi-faceted Hunter has started in 26 straight games with the Falcons (14 at LG in 2015 and 12 at RT in 2016) and played in all 40 games during his college career. He is a two-time MAC Distinguished Scholar-Athlete and Academic All-MAC. He is pegged as the starting left tackle for the Falcons in the upcoming 2017 season. Hunter was the team captain for Canisius High School in Buffalo, N.Y.
*Fun Fact: Former Rider quarterback, Seth Doege is the Wide Receivers coach for the BGSU Falcons. Read Bruce Feldman’s book “The QB: The Making of Modern Quarterbacks”. Feldman is an amazing writer and he takes a deep dive into the rollercoaster ride in developing a young quarterback. From Elite 11 camps, quarterback whisperers, advanced analytics and all the nuances that go into the making of a modern QB. If you want some insight on why it’s so hard to find a starting quarterback in all levels of football, this book is your guide. Right on! If a 'team' can be melded into a 'team' with 2 weeks training camp and two ex games (trying out 70 players) then the NFL is wasting a lot of money and time. So ... if a rebuilding team has like 10 new starters don't expect mistake free football for a few weeks. Busted coverage on D ... missed blocking assignments ... wrong pattern ... all guaranteed. So ... first couple games bet the long shots and take the points. (Week one you would have had 4/4 ... week two 3/4) Because it's still ex season. Where is the MMG? Bring it back Rod! I love the "Out of the Tunnel". Great idea. Is this penned by Rod or someone else? I like the concept, but I would like a little more "inside" material on "Canada's Team" like I have been getting for years. Yep, it takes a few games before we know what we have. We were in game two while Wpg was only in game one so logically more mistakes? First time since the RB's came into the league the team with the week one bye has won their first game. Significant, worrying but not definitive. This essay is so much better than the MMG and Something to Mitch about. Finally some intelligent life on this website!! I think you need to look at who we where playing as to why the games where close. We where probably playing the other two bottom feeders of each division. If we don't beat Hamilton we probably don't win a game until Labor Day. We have the worst QB of the starting 9 in the CFL. I could take losing if we where developing the next Jennings or Bo Levi but we are just wasting another year with Glenn. The talent is here, the attitude is here, the ability to score is here, the ability to come back late in the game is here, I have no problems with where the team is at right now because every game shows improvement. Be patient. Is there a Sportscage today? Hamiton , good thing about week 4 is we don't have to play, so we will only be 0 and 3 , Austin will be licking his chops to get at the riders. Congrats and best of luck with "out of the tunnel ". I like the professional writing and hope it continues. It fits you well. Chick's up next to exact his revenge!! Lol. That clearly wasn't written by Perderson. His blog has nothing written by him anymore. I guess he's too big time for this stuff now. "It takes a few games to know what we have". Really? We haven't had good quarterbacking since DD injured his elbow in 2014 in Winnipeg. Make all the changes you want, but if we continue going with at best a back up QB then be satisfied with a 5 or 6 win season. Jones had something like 15 or more free agent camps and the best he can deliver is Vince Young. Looks like another wasted season with our star VP/HC/DC running the ship. Rod's a star! He da man! The Riders are improved but they have, what, 22 new players on their 46 man active roster & a slew of new players on IR & the PR. This is another rebuild on the scale of 2016. It looks to me like there is a long way to go. Better teams find ways to win - absolutely true. Don't know if the Riders are in that category. Did they announce the sportscage trip yet? We will be announcing that next week! Nice stadium! Too bad about the team though. Oh well.